These are some of his works, they are tapestries, hung in Casa Depero, the former laboratory of Depero and now second venue of the Mart. The director of the Mart, Cristiana Collu, in her mission statement, writes that we should be “visionaries and Futurists”. Personally, what I get from this advice is that we should reconsider one central aspect of Futurist practice, which unfortunately has never been discussed enough. My view is that it’s all fault of Guillame Apollinaire, but that’s another story. Anyway, the idea of Futurism that I like so much is that when the futurists realized they needed instruments and tools that were not available, they invented them. They were not supposed to do that. They were not ready to do that. They were not equipped to do that. They were taking risks at doing that. But they did it all the same. Like Luigi Russolo, who wanted to include noises inside the definition of music, or rather, of the kind of raw materials that can be processed in order to make music. And what did he do? He built machines to make noises. They are here, and you might be interested to know that the american singer Mike Patton does like them. In practice, all this means allowing reality in. It’s a reality check. We want to let the world come inside the museum. This is the “Magnificent obsession” exhibition, with 1200 works from our collection. They are being displayed with a layout that is a challenge to established museum standards. Architecture that does not take into consideration the relationship with the town and surroundings is rejecting the most considerable part of its mandate. These are the reasons why we welcomed the participants of the “Digital invasion” project. After all, what they were doing was to give us money. If a group of people comes to the museum, takes photos, shares them on the web commenting “hey look at this great place”, and hundreds of people read those comments, what is really happening is that the museum is receiving money. Because the invaders are influencers – what that means is that these people are building a community for the museum, and they are doing it for free. Building communities means money, among other things, because you cannot move casual audiences to the “returning visitors” stage if you don’t involve the communities they’re part of. So we welcomed the invaders with an invaders’ kit. 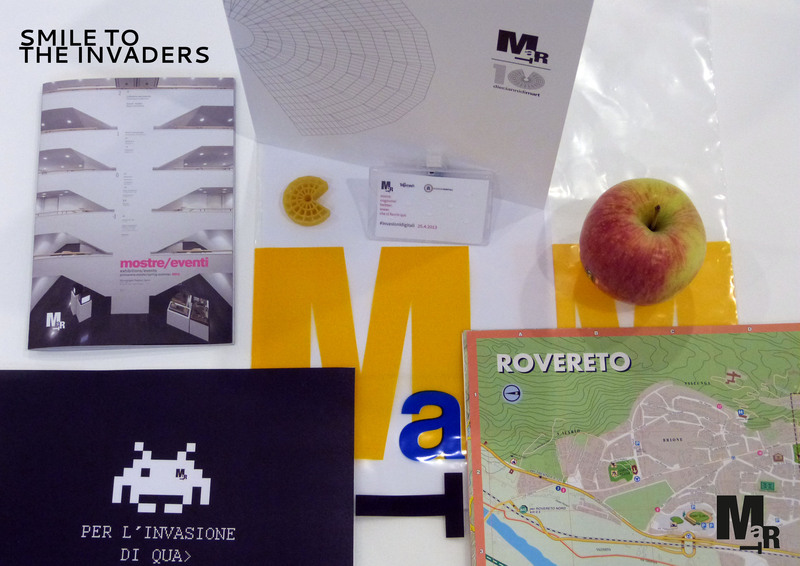 A map, museum info, a local product, an alien printout. Simple stuff. Later, I invaded the invaders’ privacy with a video camera. We’re not there yet. We have a wifi connection, but there is a login requirement. But we want to extend access. Just two arguments in favour of this choice: with a serious wifi network in place, the staff can join the net and engage on topics which are relevant to their job. They can do it while events take place, like in this photo. With an open wifi connection, more people will log in and learn. Even people without a valid ID Card. As museums professionals, our main concern should be that of extending entry points to our cultural heritage. All concerns about security, copyright infringements and cooperation with law enforcements agencies are fine of course, but they come after we’ve made everything we could to reach our mission: to make culture more accessible. Finally, in 2014 we will have a Wikipedia editor in residence. On the one hand, it will be a great chance for this person to learn about museum standards and practices. On the other, it will be an invaluable chance for our team to learn the basics of how to contribute content to Wikipedia. As museums, we preserve quality content AND we advance learning. Unaccessible quality content does not advance learning, so our contents should also be where thremajority of people are. Not exclusively, but also. On Wikipedia there are mistakes. This is all very fine, as I told you I adore mistakes (as long as it’s not out of carelessness). As museums, our duty is to raise the quality of the content that’s there on the web, and that matters for us. it doesn’t matter if the source where it is being shown can be directly related to ourselves or not. Extending access to our content and promoting quality is more important.